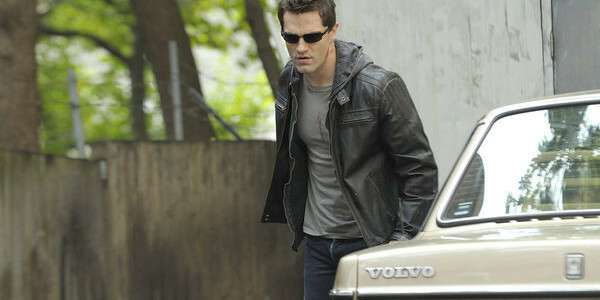 Derek B. Gayle reviews the February 27 episode of Being Human US. Don’t think there’s been enough plot momentum or action this season? Then you’re in for a treat this week, as we get to loads of vampire vs. werewolf and ghost-on-ghost action, not to mention finale-worthy shockers and potentially massive changes to the status quo. Does it handle the action well, or collapse under the pressure? Nora returns from her “sick leave” and reveals she’s been at the beach contemplating her actions for the past two weeks. Josh and Nora are having trouble getting past what happened, but it’s another full moon now and they have to decide where to change. 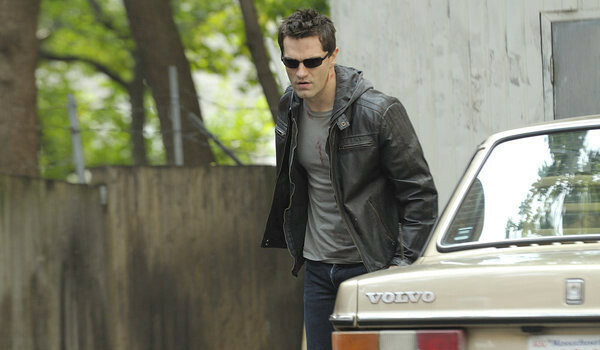 Josh and Aidan confront each other about how Josh got the police off of Nora’s case, and neither are happy. One of the Dutch, Hadley, arrives in Boston regarding the investigation into Hegeman’s death. 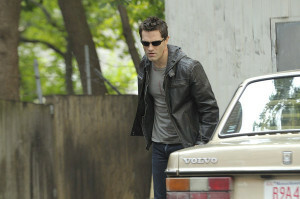 Aidan is contacted by Connor, who reveals he and Brynn turned the tables on Cecelia and now have her trapped and tortured. They think Aidan was responsible for sending her after him, and now they want to “play a game.” The twins tell Nora about Aidan sending Cecelia, and when she confronts Josh about it, they both have a falling out that leads to Nora deciding to change with the Twins. Josh follows her to them, only to find Aidan there as well. Turns out, this “game” consists of Aidan running from all four wolves, whilst trying to rescue Cecelia and recover Hegeman’s gun, both of which are hidden in the woods. Josh reveals he was the one who sent Cecelia after them, but it doesn’t matter; they transform and the game is on. Aidan finds Cecelia, but she’s too weak to go on and she asks him to leave her behind; the wolves devour her. The next morning, Nora reveals that she’s actually happier as the wolf—she felt no regret about killing Will, and hates waking up as a human the next day. The four wolves meet up in human form, but Aidan returns—and immediately shoots and kills Connor, leaving Brynn and Nora distraught. Aidan gives the body to Hadley for the Dutch saying this was the wolf that killed Hegeman, clearing Nora of guilt. Meanwhile, Sally is haunted by a poltergeist with Danny’s voice. She discovers that Danny was killed by a cellmate in prison—meaning this poltergeist actually is Danny, and he’s angry. However, Sally is saved by a surprising force—the shadowy Reaper figure, now taking the form of a gangly ghost guy. He tells her he normally reaps ghosts that throw off the balance of the afterlife, but Sally’s case is special; she passed up her door to help her friends, and she’s not a problematic ghost. But by not being problematic, she is a problem because she still shouldn’t exist. Sally realizes how disconnected she’s become from her friends’ lives, and decides to be reaped—meaning she ceases to exist, no afterlife whatsoever. She wants to tell the guys, but with them so caught up in their own drama, she decides not to, and simply sits in the corner where she died and waits to be reaped. Like “Going Dutch” last season, this episode packs in things we didn’t expect to happen until the finale, particularly the culmination of several story arcs and a couple of very shocking deaths. And like “Going Dutch,” this episode definitely ranks high, easily the best of the season thus far. What works the most is having all the characters playing off one another, and multiple storylines converging, instead of 3 separate plots. Sally still gets the shaft by having a mostly separate story from the Vampire vs. Werewolf plot, but I’ll get to her in a minute. The tension was what really sold this episode—not just in the climax itself, but what was forming between Aidan and Josh, Josh and Nora, Aidan and the Twins, and Josh and the Twins. As the title alluded to, all five of them are bound together thanks to a few mistakes. It’s great to see pay-off of so many elements; Cecelia’s turning and involvement, Will’s murder, even Hegemon’s murder in episode two and his gun. The forward momentum from each piece collided together in one intense bloody mess, and watching it all unfold was awesome. Also strong about this episode was its ability to make every character sympathetic in one way or another. Nora isn’t making the best choices, but is it fair to say she’s wrong if she wants to be the wolf? I know I talk about Kristen Hager’s performance in all of her appearances, but I have to say again that she makes Nora’s struggle believable. It’s sad that Josh inevitably won’t come to her side; either she has to change her views, or they won’t end up together. It’s incredibly tragic, because the two of them could be great together. The twins are douchebags, but an ally did send a vampire with a werewolf-killing weapon after them. And Brynn’s reaction to Connor’s death was heartwrenching. Tracy Spiridakos is clearly the stronger of the twins’ actors, and seeing her breakdown was hard to watch. Similarly, Cecelia was cold-hearted last week, but we see now that she’s basically a kid who got in way over her head. Olunike Adeliyi as Cecelia has been one of the best additions to the cast, so it’s sad to see her go. She was probably the most noble of all the characters this time, as she sacrificed herself for Aidan. It’s a stark contrast from literally everyone else’s generally selfish motives. When a periphery villain character is more of a good guy than our leads, it’s a clear indication of how far everyone else has dropped. Ambiguity is really what’s at play here; how much can we really root for Aidan and Josh when, honestly, calling them jerks is an understatement. Josh tried to have the twins killed, and Aidan actually did kill one of them in cold blood. The ending’s ambiguity for all of our core players likely sets the tone for the remainder of the season. Where do everyone’s allegiances lie, now? Was Josh walking away with Aidan a break-up with Nora? Are we seeing the creation of two warring factions? I wouldn’t be surprised to see Brynn become our Big Bad of the season now, with Nora torn about whether or not to be on her side. Sally was left on an ambiguous note, too, with whether or not she’d be reaped—though obviously this isn’t the end of her story. Let me get this out of the way first: the plot twists for her this week were fantastic. We got not one, but two misdirects as we question if Danny, the poltergeist and the Reaper were the same things. Having Gianpaolo Venuta back as Danny, albeit briefly, was very cool, even if it felt a little artificial to have him return and then die again so quickly. In fact, the problem with Sally’s story in this episode is the same as what I mentioned last week—having an episode’s worth of A-plot crammed into way too short of time. Maybe it was because of actor availability, but I wouldn’t have minded seeing more Danny vs. Sally action in ghost form. Danny was a very creepy villain in the first season, so it’s sad to see him so casually wiped from existence. Don’t get me wrong, it was great for the shock factor, and it’s great that he got his just desserts, but it felt like a missed opportunity. The rest of Sally’s plot was…eh. I did like how Sally specifically remarked at how disconnected she’s been from the guys this season. Previously, it seemed like just weak writing, but now that it’s playing into her character arc, it works (though I’d still like to see her do more with the guys.) But the stuff with the Reaper seems played out already; lots of contemplation about the universe, life, what it all means, etc. Every ghost has this conversation, and while it makes sense that it would be on their minds, the Reaper character could be so much more interesting. Overall, the performances from the leads were phenomenal; ambiguity only works as well as the actors can sell it, and Sam Witwer and Sam Huntington did a nice job appearing torn but still determined in their dark decisions. Meaghan Rath was great in her last scene as she gave her quiet goodbye—even knowing this wasn’t the end, it’s hard not to feel a pit in the stomach. And, despite the stuff with Sally, very little brought this episode down. Nice bits of comedy (listed below) mixed in with some very dark, suspenseful action, and most importantly, tons of character development. This is the most exicted I’ve been to see what comes next all season. While the flashforward at the beginning worked to tease Aidan running from wolves, why did we also see Josh and Nora waking up the next morning? It wasn’t much of a misdirect, ruined any tension of Nora potentially being killed, and just slowed down the momentum too soon. The poltergeist homage was adorable, even with the dark undertones. Nice way to lighten up the mood so things fell even harder when they got dark. So 16 days of consecutive sick leave is the limit before you’re fired? Good to know. I know Hadley was meant to be annoying, but I just couldn’t get past his teeth. Normally I don’t mind actors actually not looking perfect, but it was distracting. It looked like he had perpetual fangs. On the upside, it’s nice to know that not every vampire is uber-sexualized. Despite the intense stuff at the end, Aidan/Witwer was hilarious in this episode. From his awkward singing as he talked to Sally in public, to his apparent obsession with classic 90210, he was very entertaining. Being Human‘s Reaper essentially feels like a young version of Supernatural‘s Death (Julian Richings). I’ve never been a fan of the wolf effects, so having four of them together…wasn’t good. But I can respect the showrunners being daring enough to attempt to pay off the story despite the budget. I know the flashback to Josh giving Aidan the knife was supposed to provide some emotional resonance, but it didn’t fit well where it was placed and was just awkward. A few weeks back I worried about so many supporting characters this season. I guess it doesn’t matter if they’re killed off as quickly as they’re introduced.